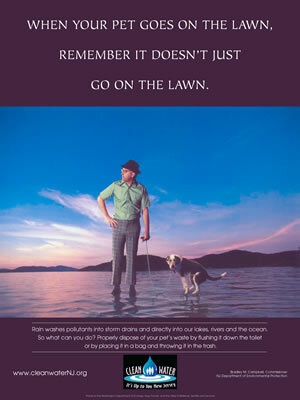 As part of our clean water New Jersey campaign, the Department has produced posters, radio casts as well as the below public service announcements (PSAs) on nonpoint source pollution, which will be aired on television though a contract with the New Jersey Broadcaster's Association, Cablevision and Comcast. If you are interested in running the PSA on your cable station (if applicable), the Department will provide a copy of the PSA. Click to view long video. The Municipal Stromwater Regulation program has put together several radio segments. Each radio cast has a message that is tailored to stormwater concerns in New Jersey and around the Country. 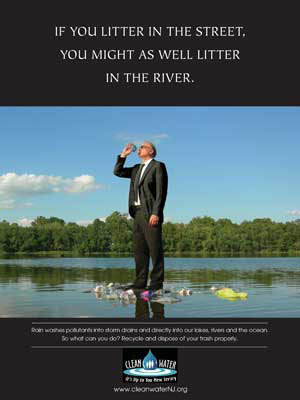 If your school or office allows you to hang posters, the Municipal Stormwater Regulation Program has designed serveral kinds to raise awareness about stormwater pollution. Contact a team member if you would like one of these posters, and we will send out out to your mailing address. Properly dispose of trash by placing it is a trash recepticle. 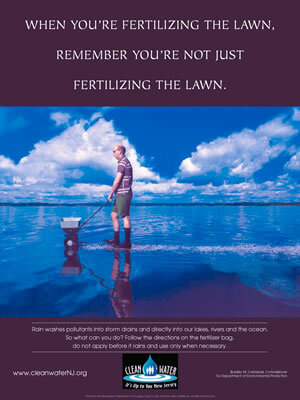 Properly apply fertilizers and pesticides by strictly following manufactures directions. 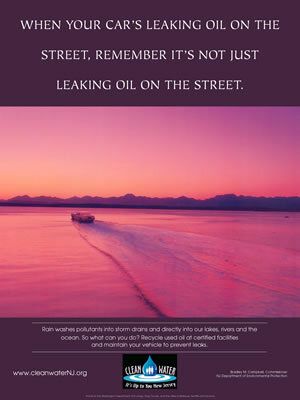 Recycle used oil at certified facilities and maintain your vehicle to prevent leaks. 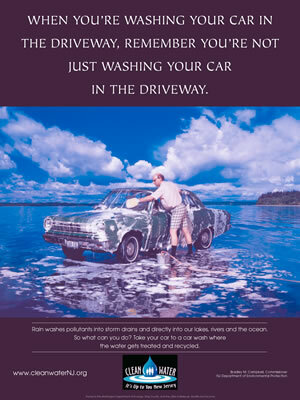 Take your car to the car wash where the water gets treated or recycled. Properly dispose of your pet's waste by flushing it down the toilet or by placing it in a bag and throwing it in the trash.